A case of racism or the authorities simply doing their job? The country's first black Rastafarian solicitor has said his career and reputation have been destroyed after he found himself in the dock facing a possible jail sentence. Jeffrey Atkinson is a well respected Birmingham lawyer and a jury last month found him not guilty of charges of conspiracy to obtain passports by deception. He alleges a white solicitor may not have been charged in the same circumstances. The Crown Prosecution Service (CPS) said its decision to prosecute him had nothing to do with Mr Atkinson's ethnicity, religion or profession. 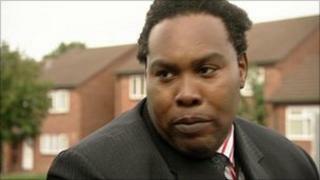 In Birmingham's Handsworth and Lozell districts Jeffrey Atkinson is well known. The solicitor has built a reputation for defending people caught up in the city's gun and gang territories. He grew up on these streets and his Rastafarian dreadlocks have become familiar in the city's courts. He claims in the past that officials found his appearance hard to accept: "I think the most important point was the destruction of the racial stereotypes," he said. "The reaction I got from the courts was amazing. I would go into court and I would have various officials in the court telling me that I was standing in the wrong place... and I should have been where the defendants were and these were court officials." Last month, he was found not guilty after being charged with conspiracy to obtain passports by deception. He was alleged to have signed a number of applications for people who were using false identities. Now he is taking his own action against the police and the CPS. His lawyer, Errol Robinson, said: "It is difficult to imagine that a white solicitor faced with the sort of allegations that were here would have been prosecuted against the very poor evidence that was presented by the Crown Prosecution Service." The CPS strongly refutes Mr Atkinson's allegations of bias saying: "The decision to prosecute Mr Atkinson was not motivated by his ethnicity, religion or profession, but was based entirely upon an objective assessment of the evidence available. "Whilst we respect the decision of the jury, we are satisfied that the prosecution was properly brought," a spokesman said. A character witness for him at the trial was the chairman of the West Midlands Police authority, Derek Webley. The prosecution asked for that information to be kept from the jury but the judge refused that application and Mr Webley gave evidence. In a statement, West Midlands Police said: "This was done by the prosecution barrister in a hearing in court with defence representatives present. "The prosecution argued that to disclose Mr Webley's role to the jury would disproportionately weight his character witness evidence and that his character evidence related to his role as a community leader and not specifically to his role on the police authority." The force reiterated that Mr Atkinson was found not guilty and they fully accept the findings of the jury. Mr Atkinson was first arrested following a police investigation called Operation Vestige which alleged that a network of people were involved in fraudulent passport applications and sham marriages. So far 32 people have been convicted in the courts.